One of the first commercial users of the Red Sqirl analytics platform for Big Data is a multinational telco, which has deployed Red Sqirl in two countries and is using it to deliver analytics on its Hadoop platform. This customer has asked to remain anonymous. Red Sqirl is a flexible drag-and-drop Big Data analytics platform with a unique open architecture. Red Sqirl makes it easy for analysts and data scientists to analyse the data on your Hadoop platform. This multinational telco operates on four continents worldwide. Unfortunately, for historical reasons these operating companies use a wide variety of different database systems and analytical platforms. As data becomes an increasingly important asset for organisations, many companies are taking steps to maximise the value of their data. In addition, most large companies now have access to many new types of data - for example, social media posts. To exploit synergies across the worldwide organisation, this multinational telco decided to standardise database platforms across the group. In order to best meet the challenges of storing and using ‘big data’, the company chose Hadoop as its standard database platform. Hadoop is currently being rolled out across the company’s operations. The company now faces the challenge of migrating existing code onto Hadoop, and allowing asset re-use and swapping across business units who have multiple historic platforms and assets. Moreover, the Hadoop ecosystem does not contain a ready-made data analytics module. The market leading traditional data analytics software platforms are not designed for the Hadoop ecosystem and tend to be inefficient when analysing Hadoop data. The telco searched for a native Hadoop analytics platform with an easy-to-use graphical interface. In addition, because of the wide variety of requirements, the platform had to be highly flexible and cost-effective for a worldwide rollout. Following a thorough technical / usability evaluation of a number of analytics platforms, the company agreed a contract to trial Red Sqirl - initially in the company’s head office and in one operating company. Red Sqirl exceeds the telco’s requirements as set out above. Of particular interest to this company is Red Sqirl's unique capability for sharing, via the Red Sqirl Analytics Store. Moreover, the Red Sqirl development has deep experience of telco analytics. Red Sqirl is already proven in predicting telco churn, as shown in the workflow below. This telecoms operator now has the confidence that their analytics solutions are scalable, deployable and easy to use. Red Sqirl was installed in both the head office and the country telco, which took a matter of minutes in each case. Training workshops were held in both locations, to ensure that analysts could get the most out of the Red Sqirl platform. Red Sqirl’s drag-and-drop interface is similar to that of most GUI analytical tools, so the training was quickly completed. Feedback from students was very positive - as the graph below shows, students scored the training very highly. The company then needed to migrate analytical assets from legacy infrastructure to Red Sqirl. The Red Sqirl development team showed the way by taking a particular analytical model that had been developed in another language and quickly porting it onto Red Sqirl. The company is now using Red Sqirl as its primary analytics platform in the country in question - and early results are promising. Academic research has always been important to Idiro – that’s how we became world leaders in the application of Social Network Analysis (SNA) techniques to telecommunications business problems. It is also why our CEO is on the board of CeADAR, the Irish Centre for Applied Data Analytics Research. In order to profile the type of connection between pairs of subscribers, we calculate the amount of time two individuals spend at peak (i.e. during working hours) and off-peak time of the day. For each pair, we can evaluate if conversations occur mainly at peak or off-peak time and give a score accordingly. In the first figure, we show the distribution of this score over all the phone calls that occurred in a period of 12 weeks. 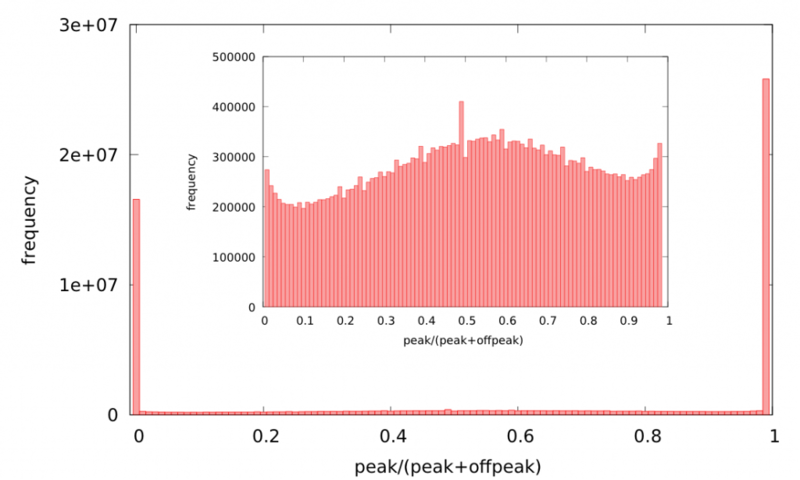 We can see two strong peaks, representing calls occurring exclusively off-peak and at peak times, respectively. We also show an enlargement of the central zone, with a broad hill representing pairs of subscribers who speak both at peak and off-peak time. This polarization suggested us to identify three layers of acquaintances: peak, off-peak, and mixed peak/off-peak. 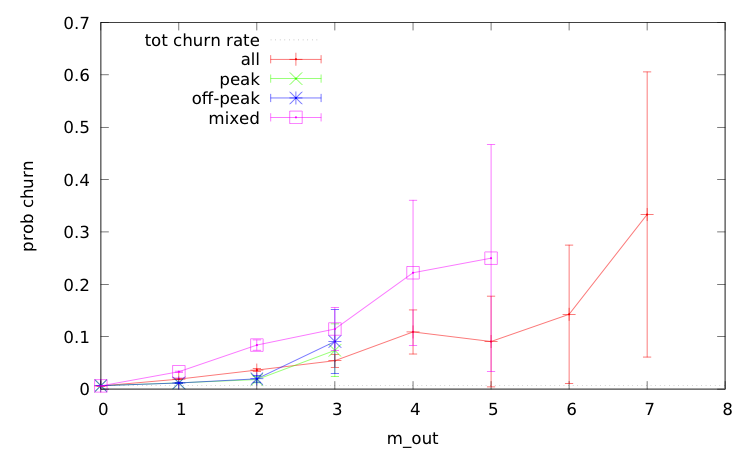 This plot shows the probability that a subscriber churns after m_out of her friends have churned in a recent time interval. Generally speaking, we can see that a subscriber with more churning friends is more likely to churn, as the red crosses tend to grow with m_out. Moreover, we can see that the probability of churning is higher for the mixed peak/off-peak layer (purple boxes), meaning that at this level of relationships, churning propagates more easily. The seminar participants were quite interested in the way we could identify types of social acquaintance based on the time of calls. They also suggested that exposure to churn in terms of duration, instead of number of churners, would improve the sensitivity of the method. In particular, Jari Saramaki, who has also experience in the data analytics industry, envisions that machine learning methods should be fed with this kind of insightful social network information to produce best lift. Idiro gratefully acknowledges the support of Science Foundation Ireland in this work. Idiro works with telecommunications companies across the world, helping them with customer retention, customer acquisition etc. To learn more about Idiro’s work on Social Network Analysis in telecommunications, or to find out how Idiro helps telcos to get better marketing results through our SNA models, contact our experts. Many commentators have noted the rise of messaging applications such as Facebook messenger, Google hangouts, WhatsApp and the granddaddy of them all, Skype – and predicted the demise of SMS. This graph, from Irish regulator COMREG’s Q3 2014 market report, shows it clearly. We await the Q4 report to see whether Q3 is a blip or the decline of SMS is starting to bottom out. However, most of us still use SMS regularly – and SMS is here to stay. SMS is ubiquitous. If your friend has a mobile number, then you know they can receive an SMS. That’s not true of any other messaging application. Whereas the OTT messaging apps all require mobile data coverage, SMS doesn’t. There are plenty remote places with coverage but no mobile data. SMS works on the poorest mobile signal. In fact, an SMS will often get through where a voice call won’t. In the UK, the emergency services have set up a 999 / 112 SMS service. SMS is the communication method of choice for most companies offering 2-factor authentication. The Next Web has a useful article on why SMS is widely used for A2P (Application-to-person) messaging. These are among the reasons why SMS has a bright future. Sure, usage will continue to decline for a while as messaging apps gain penetration – but SMS is here to stay. Idiro are thrilled to announce that we will be attending this years GSMA Mobile World Congress event in Barcelona with our partners, Apliman, from March 2-5. MWC, ‘the world’s greatest mobile event’, acknowledges and showcases that we, as an industry, are on ‘The Edge of Innovation’ and this is something that resonates strongly with all of us here in Idiro. We are constantly striving to be innovative, original and efficient in our approach to understanding our customers and their needs. If you would like to arrange a meeting with us during the first two days of the event (March 2-3), please contact our Analytical Solutions Manager, Clare Curtin, who will be happy to accommodate you. Alternatively, you can find us on the Apliman stand in Hall 5, Stand 5G23. NEWTOMS, Subject Matter Experts and leading provider of specialized professional services related to Data Collection-Mediation, and Idiro Technologies, a leading provider of advanced data analytics and pioneers in Social Network Analysis Technology today announced a partnership. This partnership gives NEWTOMS the right to offer Idiro’s services in the Latin American markets and strengthens its Mediation, Insight, Action orientation around CDR Analytics and Telco Industry; similarly the alliance gives Idiro Technologies the right to offer NEWTOMS’s specialized professional services related to Mediation and Interconnect billing solutions already widely deployed in Europe today. Idiro’s advanced Social Network Analysis (SNA) platform helps Telco Marketing, Anti-fraud and Customer Experience staff to segment and target customers. Idiro uses voice, SMS and data traffic call detail records to build up a detailed picture of the social communities within the customer base. Idiro’s analytics are predominantly used to improve customer acquisition and customer retention and to increase ARPU via cross sell/upsell opportunities. Idiro SNA’s analytics focuses on the relationships rather than the individuals – the right approach for the emerging markets where the pre-paid customer is predominant and the information available about pre-paid customers is scarce. By combining NEWTOMS’s specialized professional services with Idiro Technologies’ SNA platform, telco customers will mine data from their existing Mediation systems and draw insights from CDRs via SNA technology. This will allow the telco to identify influencers, predict churners, and select targets for successful acquisition and cross-sell campaigns. According to John Dunne, Idiro Chief Commercial Officer, “NEWTOMS is an ideal partner for IDIRO; they have an excellent track record in Latin America, they are subject matter experts on the existing data collection and mediation system and Interconnect billing solution already deployed in more than 50 sites in Latin America, they are experts offering Mediation, Insight, Action and by combining our award-winning technology and NEWTOMS expert services, we can, together, help mobile operators turn raw data into actionable insights, therefore enabling fruitful action. By integrating IDIRO’s SNA platform with NEWTOMS services, we are now in a position to offer mobile operators an end-to-end solution that will positively impact their bottom-line”. NEWTOMS professional services have helped leading operators in Latin America with key-strategic Data Collection-Mediation that have enabled them to launch services such as LTE, SMS, VAS, incorporate new network elements, feed downstream systems and improve CDRs visualization to Financial Executives. NEWTOMS has offered Mediation, Insight, Action to major Telco Groups in the region including largest Operators in Peru, Panama, Venezuela just to mention a partial list. Simon D Rees, Clients & Marketing Director, Idiro Technologies. Enterprise Ireland have been carrying out a Software & Internationally Traded Services Trade Mission in Australia this week (September 1-5) which has been led by the Minister for Jobs, Enterprise & Innovation, Richard Bruton and Enterprise Ireland’s CEO Julie Sinnamon. The objective of the mission has been to highlight Irish technology capabilities in supplying financial services, telecoms, healthcare and travel sectors and to grow exports of the indigenous software and services companies travelling on the mission to Australia. Idiro Analytics, a leading provider of advanced data analytics, today announced it has signed a deal with 2degrees, a leading New Zealand mobile operator, to provide data analytics for marketing. As part of its assignment, Idiro will provide comprehensive subscriber analytics and related training to the 2degrees marketing team, who will use the service to structure customer-facing retention programs. As a recognised innovator in the development of advanced data analytics technology, Idiro’s solutions help mobile operators combat churn and improve customer acquisition rates by predicting which mobile users are most likely to switch carriers, and by providing valuable marketing insights. Idiro analytics are also used to improve the results of mobile operator marketing campaigns by predicting which customers are most likely to take up offers for new tariffs, smartphones, and other services. Idiro’s insights are used to improve product offerings and identify opportunities among many other benefits. Idiro combines its analytics solutions with consulting services that create a comprehensive, data-driven marketing service. 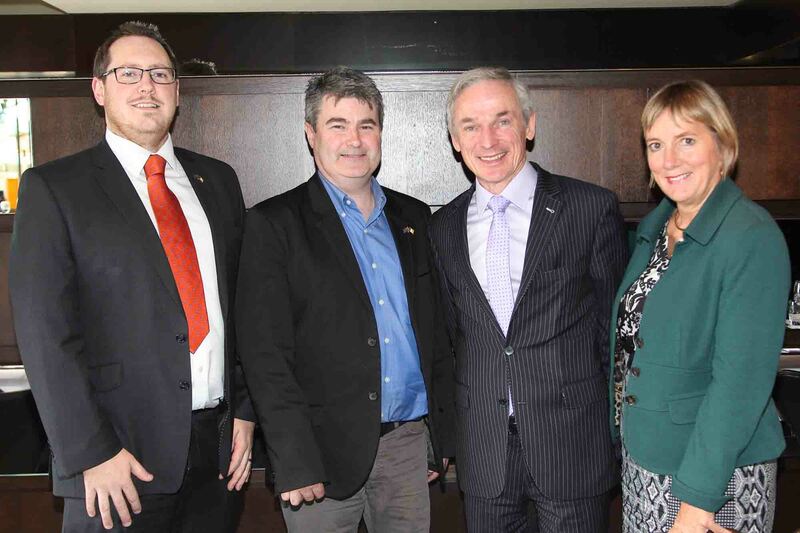 Pictured in Sydney are, L-R: Peter Doherty, Head of Service Development, 2degrees, Liam Connolly, Co-Founder, Idiro Analytics, Minister for Jobs, Enterprise and Innovation Richard Bruton TD, Julie Sinnamon, CEO, Enterprise Ireland. Speaking from Sydney Minister Bruton said: “ICT is one of the key sectors we have targeted as part of our Action Plan for Jobs. Today’s announcement by Idiro that it has signed a significant contract to provide data analytics marketing solutions to a major mobile phone operator is great news. Idiro is a highly innovative Irish company selling its services into export markets and a great example of the type of company we are trying to support through Enterprise Ireland. I wish them every success as they grow their international exports and look forward to working with them in the future”. 2degrees carried out an intensive trial in 2013, where the churn reduction capability of Idiro’s analytics service was rigorously evaluated in a highly competitive environment. Following a successful outcome, Idiro Analytics and 2degrees have agreed a contract focusing on customer retention service. Based in Dublin, Ireland, Idiro Analytics is an award-winning provider of marketing analytics to service providers and businesses around the world. Idiro specialises in advanced predictive analytics for telecoms and online gaming companies, and is a recognised leader in ‘big data’ analytics consulting and the commercial deployment of social network analysis technologies. For an overview of Idiro’s analytics services, watch the short video on our homepage www.idiro.com. Launched in August 2009, 2degrees has significantly lowered the cost of mobile in New Zealand. 2degrees now has over 40 retail outlets, 97% network coverage across the country and the team has grown to over 770, with a mix of over 40 different nationalities. The company has committed over $550 million to building New Zealand’s third mobile phone network. Company shareholders include US-based mobile communications specialists, Trilogy International Partners, the Hautaki Trust, Communication Venture Partners and KLR Hong Kong Ltd. The combined shareholders bring a wealth of international experience and knowledge which is of huge benefit to New Zealand mobile users. Visit www.2degreesmobile.co.nz for more information. Simon D Rees, Clients & Marketing Director, Idiro Analytics. AT&T’s Greg Pharo recently joined Ed Keller of the Keller Fay Group for a webinar on the Return-On-Investment of Word-Of-Mouth (WOM) marketing. He shared insightful information on AT&T’s research into WOM and the significant role it plays in driving new customer acquisition. Keller stated at the beginning of the webinar that in a recent study, approximately 85% of marketers in the US couldn’t show the ROI of WOM marketing, despite plans to increase their budget spend in the category. A McKinsey article also noted WOM as being the most ‘disruptive’ marketing factor, adding that WOM is responsible for 2.1 billion daily brand impressions in the US and 440 million in the UK. One particularly interesting statistic was that of the 90% of WOM marketing that happens offline (which is interesting in itself), over half of this was driven by one or another form of marketing or media. Of particular importance is the fact that 26% was driven by paid advertising. Targeted advertising is obviously a vital factor in driving sales through WOM and on the back of that, identifying who to target remains an increasingly important challenge. Being specialists in advanced and predictive analytics, Idiro can identify propitious customer segments so that marketers can better target their campaigns, in order to capitalise on these new figures emerging from AT&T’s research. Although paid media remains the primary driver of sales for AT&T at 30%, WOM is a close second. Pharo elaborated on this by saying that WOM explained over 10% of sales through positive comments, but also over 10% of lost sales through negative comments. He also added an interesting point at the end that maybe all media should be thought of as ‘social’. Idiro’s expertise in predictive analytics can provide marketers with a thorough analysis of their target audience, identifying the key influencers amongst communities and even amongst families and households. Using the SNA Plus platform, marketers can really take full advantage of the power of WOM, which, if this webinar is anything to go by, will remain a key sales driver for years to come. At this stage, everyone in marketing understands the power of word-of-mouth – which Tom Fishburne’s cartoon, below, elegantly illustrates. Organisations with link data – telcos, gaming companies, social networks and the like – can take a scientific approach to word-of-mouth marketing (aka influencer marketing) by deploying Social Network Analysis algorithms to target the influencers – or the influenced. Idiro is a pioneer in this space. Over the past few weeks we have been talking with two mobile operators who, prior to talking to Idiro, had each run projects to evaluate the benefit of Social Network Analysis (SNA) for improving targeting in marketing. However, in both cases the trials ran into difficulties that could have been avoided. At the end of the projects both mobile operators had invested significant time and money in running a trial, but neither was in a position to make an investment decision. We’ve been involved in mobile operator trials of Social Network Analysis for over eight years, and we’ve seen the good, the bad and the downright ugly – so we know how to run a successful trial of Social Network Analysis for marketing. Here are eight tips to help you run SNA trials that give you a clear evaluation of SNA for your business – quickly and efficiently. To what extent are the key sponsors prepared to accept the concept behind SNA for marketing? Make sure your organisation is prepared to invest in a solution before you start your evaluation of SNA. A common cause of trials not completing successfully is that the assessment of SNA that they deliver is not what the senior team needs in order to make the investment decision. Therefore, before you finalise the trial, work out the evaluation process and success criteria. We offer our customers help with evaluation methodologies for SNA in marketing. Many mobile operators make the mistake of specifying too much technical detail (while leaving the business success criteria too loose). Others base their trial design on the offering from a particular vendor. We all know which vendor will perform best in a trial like that! These are important choices, and they will affect the outcome of your trial. The most successful SNA implementations tend to have close cooperation between marketing and analytics teams. Whichever side of the organisation you work on, bring your colleagues on board early. Because they target the influencers or the influenced in your customer base, word-of-mouth campaigns need to be designed carefully. If your evaluation involves a campaign, don’t put all your effort into the technology and test it on a bog standard campaign. Idiro are experts in word-of-mouth campaigns. Be realistic about how the relationship between spend and quality. Most vendors want to cover their costs at least, during the trial. You could doubtless persuade one or two vendors to work for free, but this might mean that you exclude the best vendors. Remember also to budget for internal costs. SNA trials with thorough methodologies take time to do properly. Trials with highly aggressive deadlines nearly always overrun – typically because one or more internal tasks do not receive the priority they need. Set realistic deadlines and make sure your internal project manager has the authority to get the tasks done. Beware of shortcuts, particularly around evaluations. A successful post-trial implementation leading to a strong ongoing ROI depends on getting a number of factors right – operational, analytical, process change, KPIs, etc. When post-trial implementations fail, they do so because they don’t address these difficult issues or don’t have a strong leader keeping the focus on the benefits. Once the SNA trial is completed, the benefits are proven and the contract is signed, make sure you task the team with delivering the benefits within (say) 6 months and not just completing the implementation project. Idiro would be happy to expand on any of these points. If you are planning a trial of Social Network Analysis solutions for marketing, feel free to run your ideas by us. We might save you some heartache. The warmer weather in Northern Europe has put some of us Idiro folk in mind of music festivals. That reminds us of how we helped a mobile operator not so long ago. This mobile operator customer of Idiro’s, like many of its peers, sponsors music festivals and concerts in order to build brand preference – and to reward loyal customers. Historically, the telco gave VIP tickets away to customers chosen for their high spend or long tenure. However, a perennial problem with free tickets is that many more customers will say yes to free VIP tickets than will actually turn up on the day. Typically this operator was only seeing 35% redemption of its VIP tickets, leading to big empty spaces in the VIP area, a poorer experience for VIP guests leading to the brand experience diluted for those who did turn up, and embarrassment all round the marketing team. Target influencers within the base with these VIP tickets, to maximise the positive word-of-mouth from the VIP experience. Idiro tackled the problem by using the Idiro Social Model to identify influencers with strong social ties to other influencers on the base. In addition, a number of other approaches were also used to identify the right sort of groups of the most appropriate influencers for the task in hand. We took the trouble to find small groups of influencers who knew each other and met the telco’s spend and tenure criteria for being a VIP. And the results? The mobile operator targeted these customers with VIP tickets for the next music event – and found that the percentage of VIP customers who took advantage of the offer doubled, to 70%. Measuring the word-of-mouth benefits of a campaign like this is difficult – because the effects can be very subtle. Nevertheless, Idiro’s customer was delighted with these results. To learn more about how Idiro’s advanced community marketing analytics can benefit you, please contact Idiro. Idiro Announces Partnership with Apliman. Idiro Technologies, a leading provider of advanced data analytics for enterprises, today announced a partnership with Apliman, a leading provider of carrier-grade telecom solutions in the Middle East. 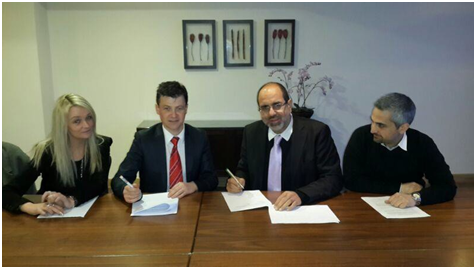 This partnership gives Apliman the exclusive right to offer Idiro services in Middle East markets. Idiro’s Social Network Analysis (SNA) platform is a scalable solution capable of analyzing billions of transactions and the hundreds of millions of users who generate them. 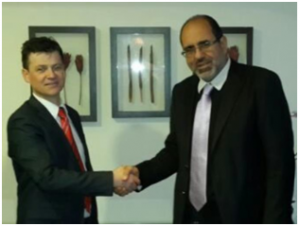 According to Rabie Al Masri, COO of Apliman, “This partnership will help put Apliman and Idiro at the forefront of the future of the telecom industry. By creating such a solution, telcos will be able to decrease churn and increase retention of their customer base”. Apliman’s Loyalty & Campaign Management solution is an easy and simple tool that operators and service providers can utilize to eﬃciently and eﬀectively carry out campaigns. As a result this will allow telcos the ability to attract new subscribers, increase network usage, encourage dormant subscribers and promote a new service, as well as strengthen their position in the market. By combining it with Idiro Technologies’ SNA platform, clients will better retain and acquire customers, cross-sell and up-sell, identify inﬂuencers, identify families and households, and predict rotational churn. According to both parties, this partnership will prove to be most beneﬁcial, as each company’s solutions complement each other. As stated by Tarek Itani, CEO of Apliman, “By oﬀering such a solution combination, such as Loyalty & Campaign Management with SNA, clients will gain a competitive edge in the market.” As a result, this combination created a revolutionary product that is essential for telcos. According to Aidan Connolly, CEO of Idiro Technologies, “Apliman are an ideal partner for IDIRO; they have an excellent track record in the Middle East and Africa, and by combining our technology platforms we can, together, help mobile operators turn raw data into actionable insights. By integrating IDIRO’s SNA platform with Apliman’s CMS we are now in a position to offer mobile operators an end-to-end solution that will positively impact their bottom-line”.